Sometimes I have in my head a scene where I put a cherry in front of a duck and tell that duck* that it and the cherry are meant for each other. The imagined scene often ends with the duck giving me an indignant stare, holding up the middle pointy end of one of its webbed feet. Yet, I figure, with or without an approving quack from our feathered friend, this is definitely a case of anyone of us knowing better than the duck: duck and cherries go together. And the reason I mentioned duck is because the making of this cherry vinegar was undeniably duck-induced. The fact that the cherry season is approaching was certainly part of the reason I stayed up late one night making vinegar, but the main driving force was — believe me — an inexplicable craving for a salad with duck confit. Using my go-to cranberry vinegar recipe from Blue Ribbon Preserves by Linda J. Amendt as the guide, I came up with this sweeter variation. In a nonreactive pot, heat up 4 cups of white balsamic vinegar** until it starts to simmer; remove the pot from heat right away. Do not let the vinegar boil. Let it cool 10 minutes. 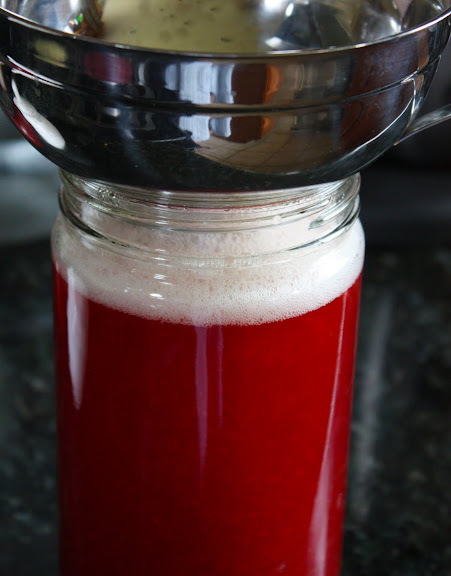 In a blender, liquefy 3 cups of pitted fresh cherries with the vinegar. Funnel the cherry-vinegar mixture into a very clean wide-mouthed jar. There will be foam; don’t worry. The foam will subside within a few hours. Cover the jar opening with two pieces of plastic wrap, stretched taut. Screw the top on. 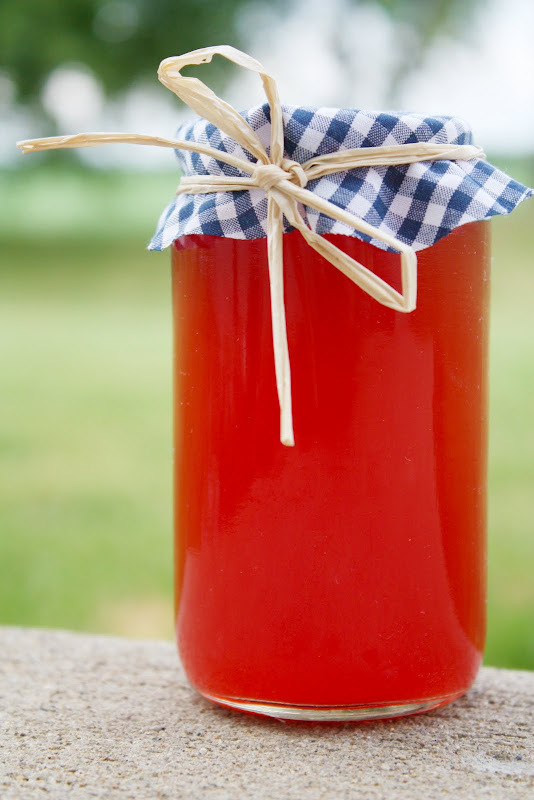 Leave the jar in a cold, dark place for two weeks, shaking the jar once a day. 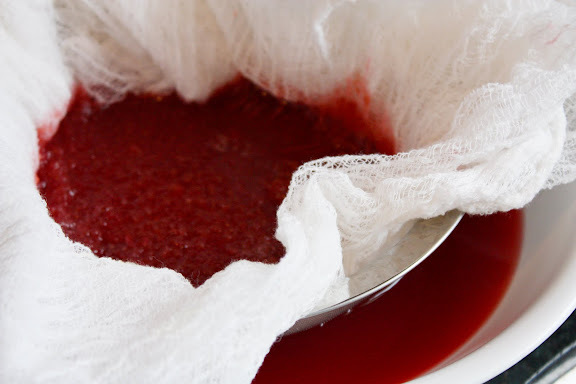 After two weeks, strain the vinegar through a cheesecloth-lined colander. If you want the vinegar to be crystal clear, strain it twice more through a colander lined with a coffee filter (I didn’t do this). The cherry vinegar is now ready to be stored in any nonreactive container of your choice and used in a recipe. It keeps in the refrigerator for up to 2 months. *Of course, I have to talk to the duck! You think I’m crazy enough to talk to a cherry? **I tried rice vinegar and didn’t like it. If you like rice vinegar, go for it. Try to stick with colorless vinegars, though, as you want the color of the cherries to come through. I love white balsamic the best. Oh, I so have to make this! Interesting, Cherry and Balsamic…have to look into this. Sounds amazing and the colour is outstanding. Well, I just happened to have some cherries in the fridge, but not white balsamic, so I just made it with regular balsamic. It’s cooling its heels in the fridge right now, but I did taste it before sealing it up — tangy sweet goodness! I’m looking forward to trying it on a fruit salad (that mango on my kitchen counter is calling). It should also work well with the pork chops in my freezer. Thanks for the idea! This sounds just amazing, and I’ll have to make it, its certainly cherry season here. I love Linda Arendt – Her 175 Best Jams, Jellies, and Marmalades is a must for me. Hi Leela, how I’ve been missing on your blog all these while escapes me! I was searching for Thai Sweet Chilli Sauce and I found my way here … thank goodness for that. 😉 Trawled trough your recipes and there are already a few I want to try out. Brilliant photos, great writing. Kudos! would plain white vinegar work? Sounds great, but for REAL cherry vinegar, make cherry wine, dilute to 7% alcohol with water, add a few ounces per gallon RAW ACV (supermarket) as a starter culture, cover loosely & wait 2-3 months. I just bought some cherry’s and wanted to try cherry vinegar. I love fruit infused vinegar but have never really infused anything beyond my long standing pepper vinegar that I put up every year. I’ve also added garlic, dill and other herbs to vinegar in small jars which I keep on the refrigerator door until they’re gone. But, I am just re-learning about fruit infused vinegar’s. I have a book on infused vinegar’s that I purchased 20+/- years ago, but just never had the time or inclination to make it myself before. So, here goes . . . . I am excited about having another ‘made-it-myself’ delicacy to use in my cooking. that extra layer of flavor too. We make our own (mostly grape, blackberry and persimmon) wine and sometimes a bottle goes to vinegar which we use in our brine when making pickled beets or we’ll use in other ways like adding a tablespoon +/- to homemade salad dressings that call for vinegar. Or I’ll use it to flavor soups or sauces. Taking that and adding more fruit might be worth a tasty try. Hmmmm!!!!! Thanks for posting and pics!